They must just consider me a harmless nutcase by now. The US immigration officer at the border between Vancouver and Seattle eventually just shook his head and let me in, after I explained to him that I had travelled all the way to the west coast, and was now on a bus from the Canadian city's airport to the one at its American neighbor, simply to fly back and forth across the continent again. And no, I would not do this on my own but with a friend whom I'd met in a London pub ten years ago, and kept in touch with ever since. "And you do all of this just for the miles?" he asked, incredulously. So here I am now, high above the appropriately named fly-over-country of middle America, jetting into the first of many sunsets. I have time to contemplate if those frequent flyer miles are really the sole incentive behind this, and previous, jaunts. Certainly, from both a personal and a professional point of view, I can attest to the potency of rewards currencies. 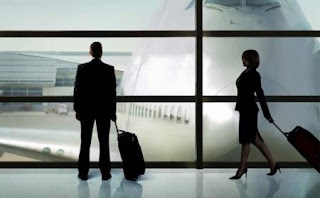 Redeeming miles for flights in Business or First class, on industry-leading airlines, to exotic destinations is a very addictive habit, and knowing how to successfully hunt for these elusive free seats takes away the potential for frustration. Even more importantly, frequent flyer programs extend to their most loyal customers (or should they be called largest victims?) the privileges of Elite status. And once you've become used to perks such as lounge access, security fast track. reservations for the seats with the extra legroom and, in North America, not having to pay for checked bags, you will never want to go back. It is not for nothing that road warriors proudly dangle their program's "mine-is-bigger" baggage tags from their trolleys. It is the angst of loosing status, as much as jet fuel, that propells me through the skies in this quest for 35'000 miles in three days. "I have to defend my status! ", a German friend once proclaimed. An even bigger privilege than Elite status, however, is to have a trusted wingman by your side. In sharing the tension of running for connecting flights, the misery of cheap microwaved pasta served at 35'000 feet, the pain of over-euphemized announcements (why say turbulence when you can say "rough air"? ), these unavoidable aspects of Airworld become bearable. Knowing that you're not the only person crazy enough to do what you do creates a sense of normality, and gives you somebody to share memories with. And when that shiny new Gold / Platinum / Diamond card arrives in the mail, you know that at least someone out there will be able to appreciate what it took to get it. Most importantly, as you sit back in your seat, watch the setting sun turn the clouds below a warm red, and order another Campari Soda, there is somebody to talk to. Or, as 10 million miler Ryan Bingham puts it in Up in the Air: "To know me is to fly with me."